Hello my wonderful friends! Last night I inked my fingers, yay! felt so good!! Summer is here and DD and I are spending time outside, working primarily in our garden, I have a lot of lettuce and some little tomatoes are showing up, so excited! I promise to share pictures later. DD loves to run around the sprinkles and get crazy, LOL. Anyway, this is the card I made last night. I used the new paper from BasicGrey "Cappella". The stamps I used are from "Botanicals" set. I inked all the edges and then distressed them. For the image I used the Embossing Resist Technique and I added some Pretty pearls around. Ink: Peeled Paint Distress (Ranger), Antique Linen Distress (Ranger), Espresso Adirondack (Ranger), Versamark. Embellishments: Green Satin Ribbon (Offray), Pearls (Michael's). Accessories: Sewing machine, Thread, Distresser (CTMH), Clear Embossing powder, Heat gun (Marvy Uchida), Foam tape, Sponge dauber, Circle and Square Nestabilities (Spellbinders). Hello friends! Are you having a good day? I hope you do! I am having one of those days that I am not feeling good so I am praying for a better one for the rest of my day. Today I want to share with you a card I submitted for publication, but it was not chosen. I really like this card and I hope you do too. Make card from Cardstock, ink edges. 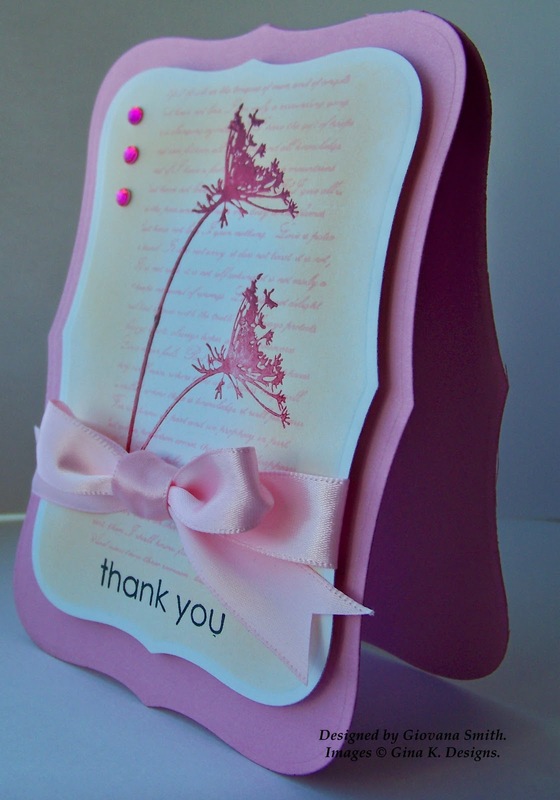 Stamp BG image, then stamp flower image in Versamark Clear, add some clear embossing powder. After that sponge the image with a contrast ink color. Distress edges and mat with a piece of CS and add stitches. Cut a piece of Cardstock, stamp sentiment, ink edges and add stitches. Distress borders as well. Add some jute twine to a button. adhere to card. Ink: Real Red (SU), Vintage Linen Distress (Ranger), Versamark. Hello my friends and Happy Saturday! Are you having a good Saturday? So far, I am! I just finished watching the first Soccer Game and getting ready for the next one: USA vs Ghana. I hope the USA win this one so they can be playing in the next round!! Anyway, for today I have a CAS card for you. 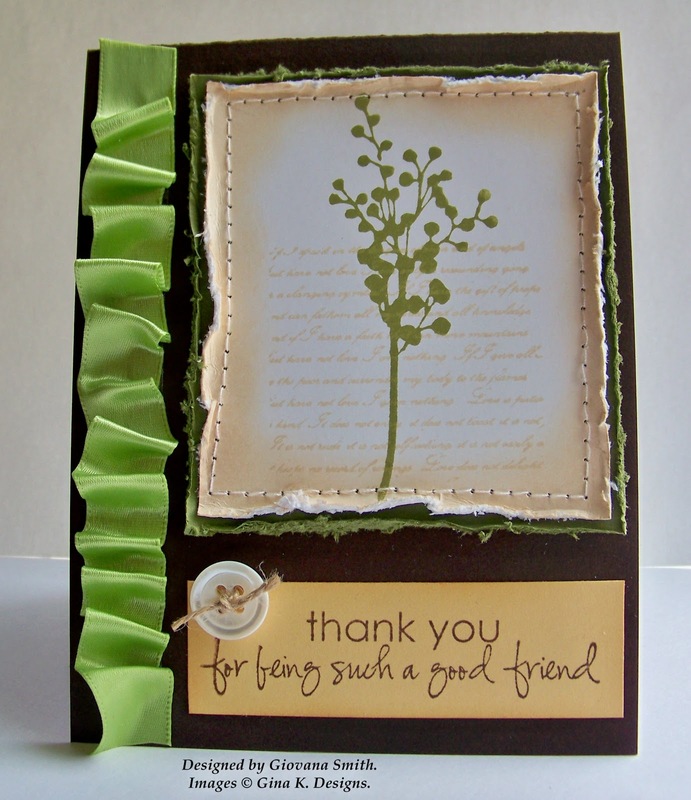 I started my card with a piece of Kraft PL CS, I stamped the flower and sentiment in Memento Rich Cocoa in Ivory CS, inked edges, then I matted it with a piece of Chocolate Brown, punched the button borders. Finally I added some straight stitches and little tiny Pearls. Ink: Memento Rich Cocoa (Tsukineko), Vintage Linen Distress (Ranger). Embellishments: Pearls (Recollections), Clear and Gold Glitter Glue (Studio G). 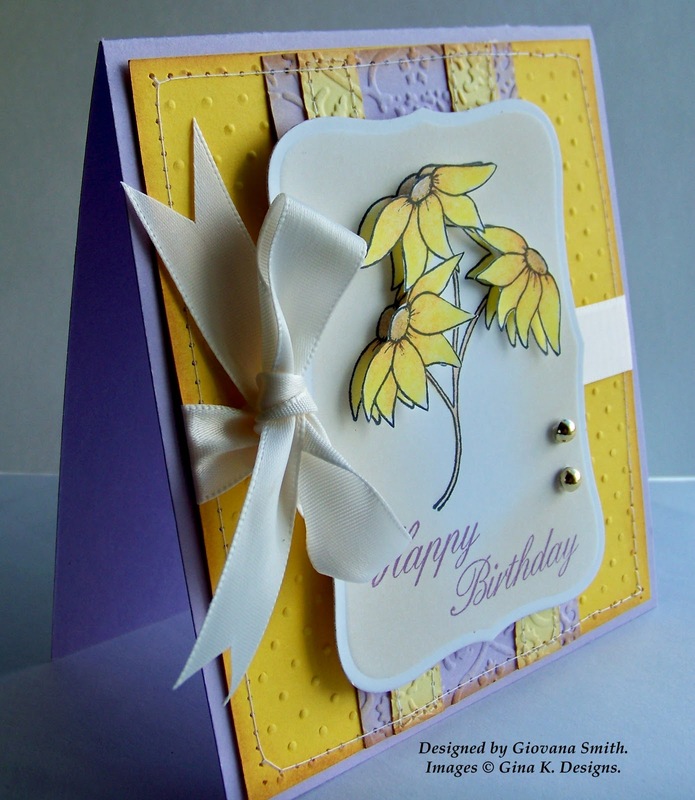 Accessories: Sewing machine, Yellow thread, Sponge dauber, Sunburst Border Punch (Fiskars. Speedy the Cat's Friends Challenge: 3+ flowers. Have a great "soccer" day!! Hello my friends, how are you doing?? I hope you are doing great! I can't believe my last post was last Monday. To be honest, I've been doing a lot of yard/garden work. The weather just started to get better, finally we are having warm days, LOL. My veggies are looking much better now, and I love spending time there. Also, my craft room was a big mess and that didn't bring to much inspiration. Finally, I cleaned it up and I have a lot of projects to show you this week. So, Friday is a "Christmas Challenge" over at Stamp TV, and this week I have a nice challenge for you. I want you to "Show me your Style". I don't really know if I have one style, I love embellishments, layers, stitches, distressing, just to mention few. This is the card I created for this week challenge. I started my card with a piece of Ivory PL CS, then matted a piece of Rocket Red Textured PL CS and a piece of Vintage Holly Digital Paper. The Poinsettia is from "A Year of flowers" and the sentiment is from "A Very Merry Christmas". The beautiful Ribbon is from Holiday Collection. Ink: Memento Rich cocoa (Tsukineko), Memento Tangelo (Tsukineko), Versamark. 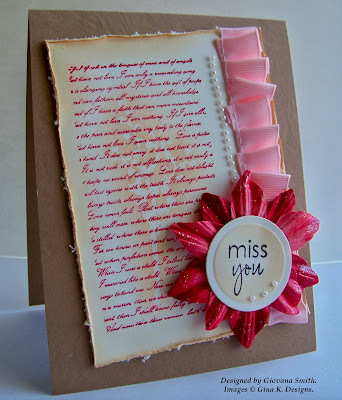 Embellishments: Holiday Collection Ribbon (Gina K. Designs), Red Rhinestones (KaiserCraft). Accessories: Sewing machine, Printer, Gold embossing powder, Embossing gun, Threaded Water Border Punch (Fiskars), Foam tape, Cuttlebug, Snowflakes Embossing Folder. Sketch: "Go to Sketches Challenge #4. I hope you like it and could play along with me too. These 4 designers have provided StampTV with a challenge each week during the months of March, April, and May, which totals up to 13 challenges! To view each of their challenges in one area, click on their names and it will direct you to their Idea Center Inspiration Page. Even better, we have a special StampTV Challenge Magazine Volume 2* located on the Freebie Tab, where all 52 of their challenges are shared in a download PDF that you can save to your computer and print out at your leisure! *We will be doing a similar magazine for our first Challenge Hostess team as well in the near future, so watch for that soon. To honor the team a bit more, several GinaK Designers are joining together in a special thank you blog hop and would like to invite you to join us! 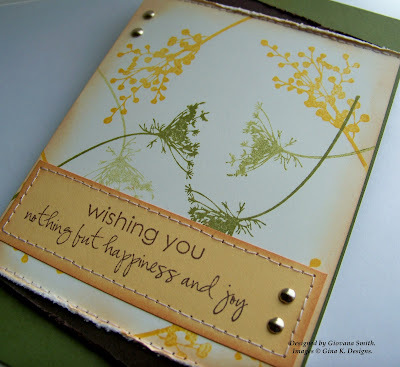 After visiting the links below, please check out this discussion on StampTV and share a favorite card you've made in the past or a new one you're inspired to make using one of the challenges from any four of the challenge hostesses. Giovana Smith "You are HERE"
So, these are the cards I created for these fabulous ladies! Thanks again for the great job you did. 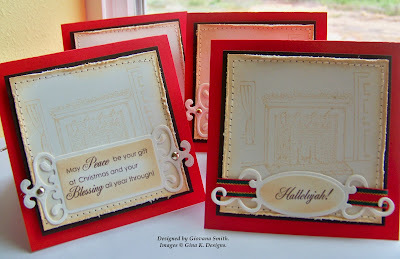 Embossing: "Speedy The Cat Challenge"
Sentiment only: Stampin' Sisters in Christ. Ink: Memento Tuxedo Black (Tsukineko), Weathered Wood Distress (Ranger). 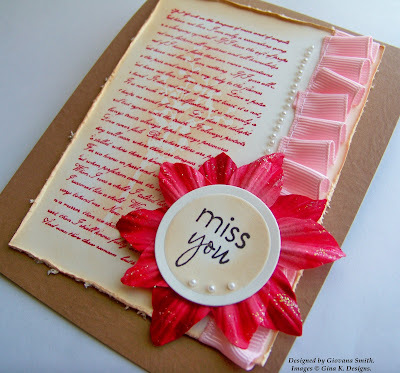 Embellsihments: Paper Flowers (Michael's), Mini pearls (Recollection). Accessories: Cuttlebug, Textile folder, Label 8 Nestabilities (Spellbinders), Dauber sponges, Foam tape, Mini glue dots. Karen's Anything But a Card Challenge: I chose the "Stamping in Fabric" Challenge. I have a huge collection of Cross Stitch fabric and thread, so I used a piece of DMC Aida fabric for this project. Ink: Memento Tuxedo Black (Tsukineko), SU Markers. Embellishments: Gold Rhinestones (Recollections), Yellow Satin Ribbon (Offray). Accessories: Cuttlebug, Swiss Dots folder, Mini glue dots, Socr-Tape, DMC Aida fabric, DMC thread. Vicki' Sketch Challenge: Choosing one of Vicki' sketches was a little hard because all of them are great, but I looked and looked and chose #2. 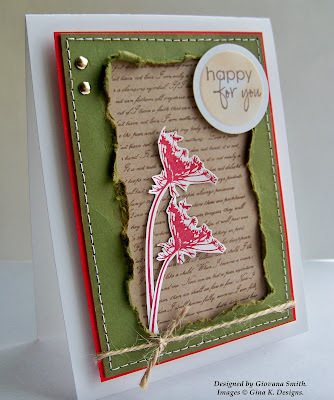 Stamps: Botanicals (Gina K. Designs). Embellishments: Gold Rhinestones (Recollections), Orange Satin Ribbon (Offray). Accessories: Sewing machine, Medium glue dots, Foam tape. Sentiment only: Stampin' Sister in Christ. 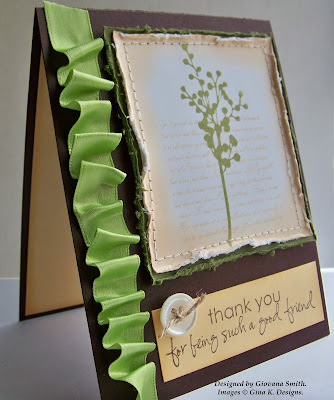 Embellishments: Paper Flower (Prima), Brad (Bo Bunny), Green Satin Ribbon (Offray). Accessories: UTEE, Embossing gun, Uni ball White Pen, Foam tape, Label 8 Nestabilities (Spellbinders). Hope you like my cards and Thanks again to these wonderful ladies!! I will call my dad later and wish him a very especial day and of course I will spend the afternoon cheering up Brazil in the World Cup, I love soccer!! Here is a card I taught few weeks ago, I hope my husband like it! Have a great day everyone, enjoy it!! Hello my friends (again). I have a new card for you today. 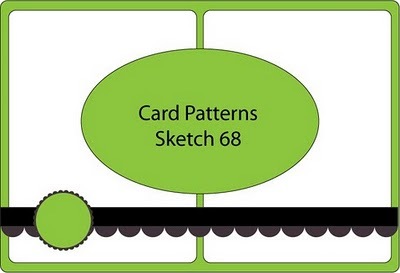 This time I used the sketch from Card Patterns Blog. 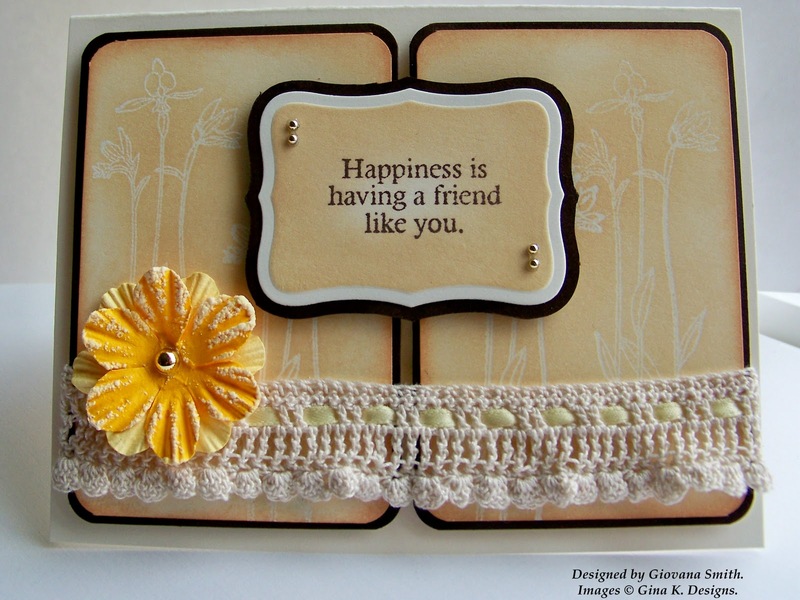 I used with my new "Friends are Forever" Set, this one is Free when you purchase 3 sets!. I stamped the BG flowers in Versamark Ink, then added some Clear embossing powder. After that, I sponged the whole area with Vintage Linen Distress Ink, and the borders with Tea Dye Distress Ink. The sentiment was stamped in Memento Rich Cocoa. I added some handmade Crocheted lace (I made it) and added some Yellow Thin Satin Ribbon. Finally I added a couple of Yellow Prima Flowers! Ink: Vintage Linen Distress (Ranger), Tea Dye Distress (Ranger), Memento Rich Cocoa (Tsukineko), Versamark Ink. Embellishments: Paper Flowers (Prima), Gold Rhinestones (Recollections), Yellow Satin Ribbon (Offray). Accessories: Corner Punch (SU), Label 8 Nestabilities (Spellbinders), Dauber sponges, Foam tape, Clear embossing powder, Heat Gun, Medium Glue Dots. In other news: I want to say Thank you very much!! to all of you you supported me on the Gallery Idol Contest. Sadly, I didn't make it to the next round, but I am so happy I made it this far, this is the first time I am in a big competition and had a blast!! I will recommend you to try it next year, it is awesome!! Hello my friends, It's Friday and that means another fun Challenge over at Stamp TV. So, for this week I have a fun challenge and I hope you can play along with me. This week is all about Tags!! So, yes, you guessed it right, this week challenge is to create "Christmas Tags"
For my tags I started cutting 6 pieces of Kraft PL CS using Label 8 Nestabilities. I created a BG using 1 Co.13 from Botanicals in Vintage Linen Distress Ink, then I stamped the branches from Hope Grows in Broken China and Peeld Paint Distress Ink. The sentiments are from "A Very Merry Christmas" and the dove and butterfly from Hope Grows as well. 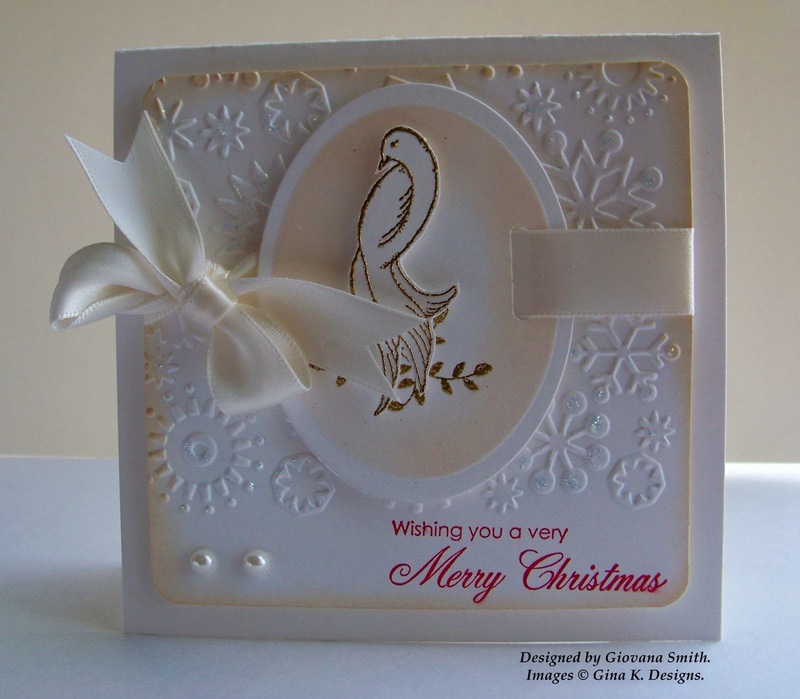 I stamped the dove and butterfly in White Craft Ink and added some Red Embossing powder. Finally I added some Jute Twine and red Rhinestones. All the borders were sponged with Tea Dye Distress Ink. Hello my friends! Today, I am very happy, why? Because I am not having the nasty sinus headache I've been having for the last 4 days!! I am having some little pain around my nose, but that's nothing in comparison with the horrible pain I've been having, so I am very happy!! 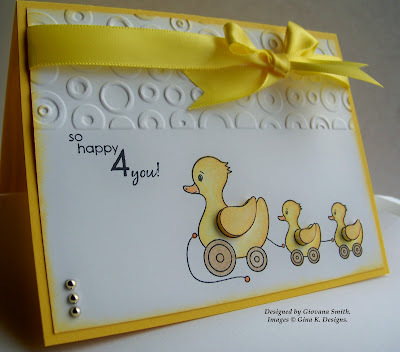 For today, I have a cute baby card, who doesn't love baby cards? Aren't they cute? I think this one is cute and simple too! I started my card with a piece of the new Wild Dandelion PL CS, then I worked with a piece of White Layering Weight PL CS . 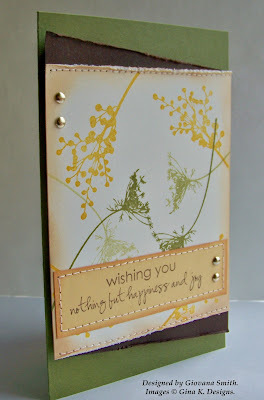 I embossed the top part of this piece using Spots and Dots Folder. 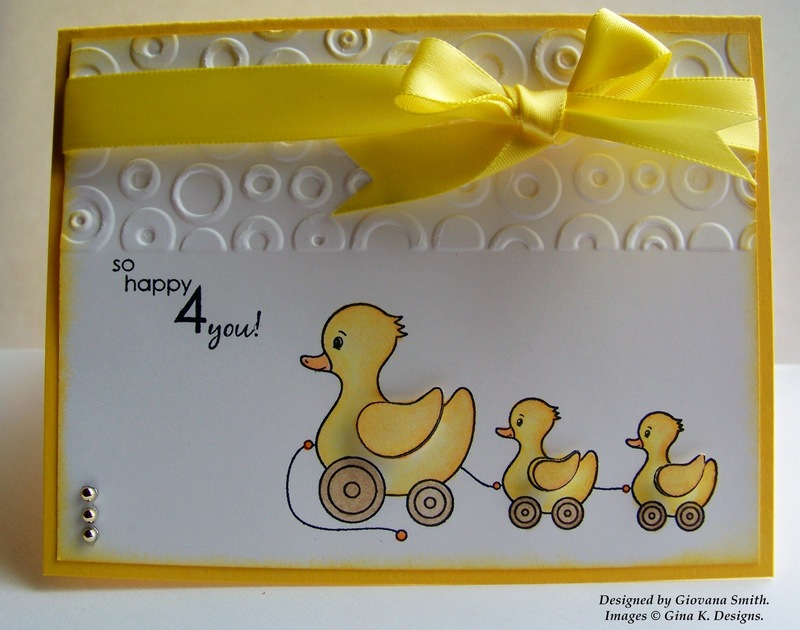 Then I stamped the cute ducks image from Oh Baby Set and colored it with Prismacolor Pencils and OMS, in an additional piece of CS I stamped the wings and colored them as well and then cut them out and positioned them on top of the main image. 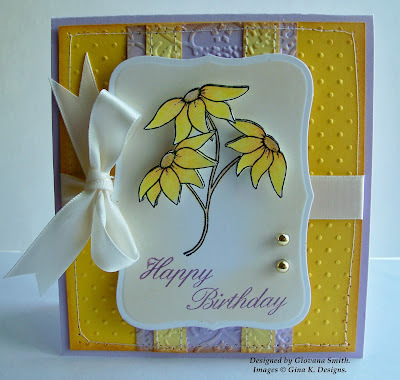 Finally I stamped the sentiment and added some Lemon Satin Ribbon and some Mini Gold Rhinestones. For my card I used the sketch from "CPS Blog"
Embellishments: Lemon Satin Ribbon (Offray), Mini Gold Rhinestones (Recollection). 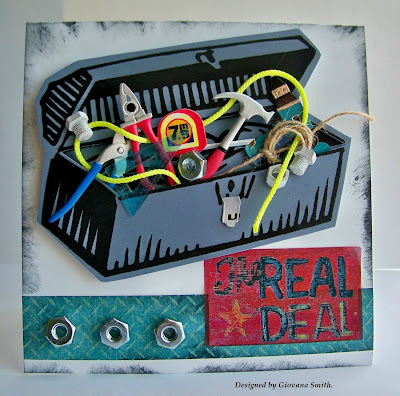 Accessories: Cuttlebug, Spots & Dots embossing folder, Prismacolor Pencils, OMS, Foam Tape. Missing you & Miracles Blossom. 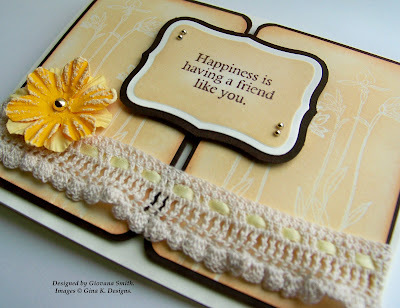 "Gina K. Blog Hop"
Hello my friends, are you havong a great day? I hope so. I am having a miserable one, yes, allergies are ruining my day, I just came back inside from some garden work and now my eyes are getting itchy again, yikes! I hope all these nasty sympthoms go away because it is not fun. 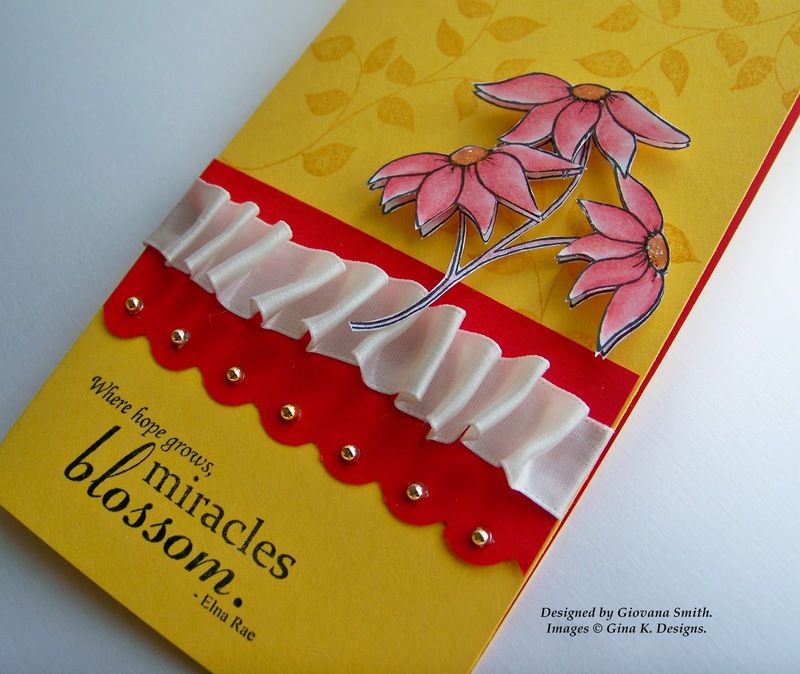 Anyway, I have a couple of cards that I am submitting for Gina K. Blog Hop "Summer Memories"
Miracles Blossom: As I told you yesterday I have a lot of memories spending time at my grandma's house during the Summer Time. I remember she had the most beautiful flowers ever, I enjoyed playing in her garden (and sometimes cutting her flowers, oops) with my cousins (all girls). Oh, those times! It's so good to remember that. 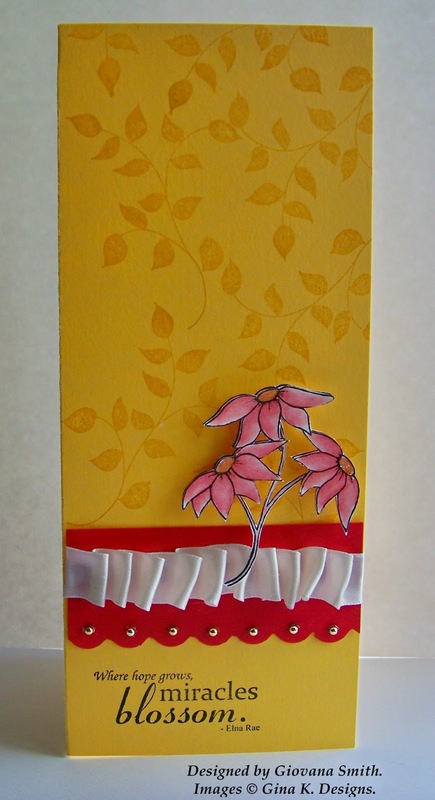 So, here is my card, I took Theresa's new set "Hope Grows" and stamped the leaves in a piece of Wild Dandelion CS and create a BG, then I took a scrap piece of Red Hot and punch the border and add some Gold Rhinestones, then some ribbon and adhered to my card. 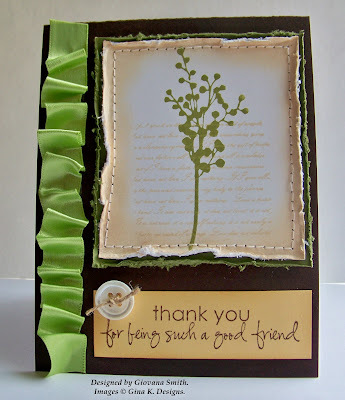 I stamped the flowers in White Layering Weight CS in Memento Tuxedo Black. Colored them with Prismacolor Pencils and OMS. Finally I stamped the sentiment in Memento Tuxedo Black. Final size card: 8.5" x 3.5"
Accessories: Stamp-a-ma-jig, Foam tape, Corner punch (for scallop border), Prismacolor pencils, OMS, Scor-Tape. So, for this card I used Nina's new sets "Fine Furnishings" and "Fine Furnishings Additions". 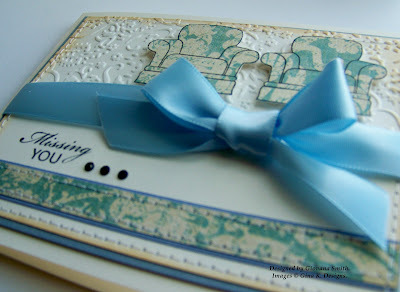 Final size card: 4.25"x 5.5"
Stamps: Fine Furnishings and Fine Furnishings Additions (Gina K. Designs). Accessories: Cuttlebug, Textile embossing folder, Sewing machine, Foam tape, Dauber sponge, Mini glue dots. Hope you like my creations. Thank You! Gina K. Blog Hop. Hello dear stamper friends! I hope you are enjoying your (close to) summer time, here we just started having some nice temperatures and it feels great and I am enjoying working on my garden and spending some time outside, but since last weekend I am having really bad allergy attacks, yikes! I don't like it at all. Anyway, it's time again for Gina K. fun blog hop (and search for the next Guess designer, yay! ), this time the theme is Fun Summer Memories! I have so many, but I want to share with you this one I love!! When I was a kid, my favorite day was Sunday because we had to go to my Grandparents house and enjoy family time. I come from a very large family, so it was always great to see all (a lot) of my cousins and play outside until we couldn't walk anymore, LOL. Also my grandma used to make the most and my favorite ever dessert!! I used to call her Saturday night and asked her if she would make it for next day (I love this) and I always heard a YES! After enjoying dessert, I remember running to the kitchen and give my grandma and big hug and say Thank you, thank you, thank you!!!! She always put her arms around me and gave a nice and sweet kiss. Oh how I miss those days :) I miss her a lot, she was like my second mom after my mom passed. Anyway, this is my card, it is simple, but it means a lot to me!! 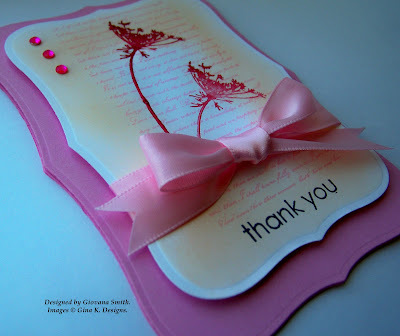 Embellishments: Pink Satin Ribbon (Offray), Dark Pink Rhinestones (Kaiser Crafts). Accessories: Label 8 Nestabilities (Spellbinders), Foam Tape, Daubers, Mini glue dots. The Real Deal "Gallery Idol Top 15"
The Real Deal: I started my card printing the toll box twice (image got it from Clip Art Microsoft Word) in a piece of Little Boy Blue CS. I cut them out and from the second image I cut the inside so I could put all the inside inside. The embellishments are from EK Success. In the tool box I included some nuts, jute twine and Yellow Mason Twine from my garage. The sentiment is a sticker and the Nuts form the bottom are the real deal from my garage. I sponged the borders with Memento Tuxedo Black, because who keep a tool box clean? Not my husband, LOL. Embellishments: Tool accessories (EK SUccess), Stickers. Garage Items: Yellow Mason Twine, Jute twine, 3/8" Hex. Nut. Accessories: Foam tape, Medium Glue dots, sponges, Computer, Printer. If you have voted before, you need to log in and repeat the same process as before. 1. You’ll need to register with the contest tool to vote, so first go to the “Registration” tab. 2. Once you’ve registered, then click on the “View Entries” tab. Thanks so much and I will appreciate your votes. Hello my friends! Sorry for being MIA. We made a mini trip to the West side to visit my in-laws and also celebrate my MIL's birthday. DD had a great time with her cousin (15 yo) and some of the little neighbors around. She played so much that she didn't have any problems to go to bed, she slept hard as a rock, LOL. We came back home today and I had to finish my project for the Gallery Idol Top 15!! (I hope you can support me again with your votes) I think you are going to like my card, come back tomorrow (11:00 am PT) so you can see my project. But today I want to share with you the card I made for my MIL. She loved her card and I hope you too. I used my new set "Hope Grows" from Gina K. Designs and stamp the flowers and colored them with Prismacolor Pencils and blended with OMS. I colored a second set of flowers, cut them out and adhered them on top. The BG was created with Swiss Dots and Textile folder. Embellishments: Antique White Satin Ribbon (Offray), Gold Rhinestones (Michael's). Accessories: Sewing machine, Cuttlebug, Swiss Dots embossing folder, Textile embossing folder, Label 8 Nestabilities (Spellbinders), Foam tape, Dauber sponge. Hello my friends! I have more projects coming tomorrow. Thanks so much for coming here and check my other projects. In other news, I made it to the second round in the Gallery Idol!! I am in the Top 15!! I am very excited about it and the voting process starts on Monday at noon (MT). Hello my friends! Time for another fun Christmas Challenge over at Stamp TV. If you have a minute, take a look of all the beautiful creations for the first challenge! I was so impressed and I got super inspired. Thanks so much for playing along with me!! This week challenge, we are going to make our "Sentiments/ Saying" be the Star of our challenge. So my challenge for you is to "focus on your sentiment". Final card size is 4.25" x 4.25"
Ink: Vintage Linen Distress (Ranger), Memento Rich Cocoa (Tsukineko). 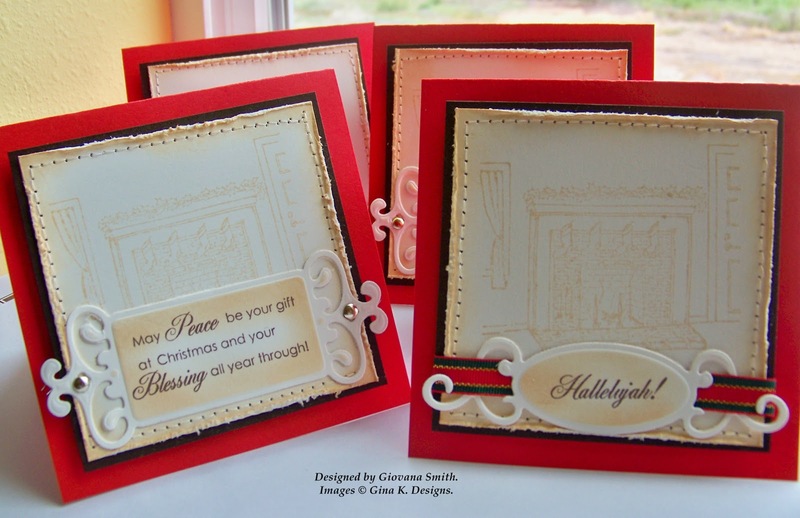 Embellishments: Holiday Ribbon Collection (Gina K), Gold brads. Accessories: Distress Edger (CTMH), Sewing machine, Fancy Tags (Spellbinders), Dauber sponge. I appreciate your sweet comments. Hello my friends! After all the excitement about the Gallery Idol, my mojo decided to take a break! I hope it comes back soon :) Anyway, I want to say Thank you for all your e-mails and well wishes into the Gallery Idol competition. I have to say this year has been an awesome year into my card-designing adventure! SO many things had happened. Today, I want to share with you a card I taught last week. It is a very simple card, but elegant at the same time. As you can see, I am using Botanicals Set again! I love this set, the images are pretty and the sentiments just great! This is a Must -have set in your stamp collection. I started my card with a piece of Innocent Pink, I added a piece of PP from "Out & About" Collection, I tore some Bright Red CS (with white core) and then sponged the borders. 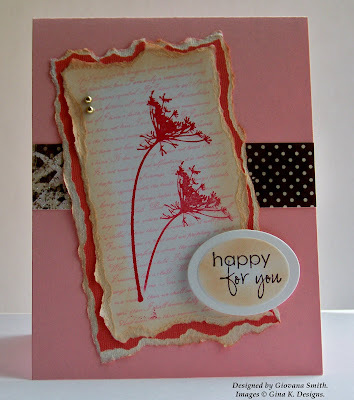 I stamped the BG (1 Co. 13) in Pretty in Pink Ink in white CS, then I stamped the flowers in Real Red and tore and sponged the borders as well. For the sponging I used Vintage Linen Distress Ink. 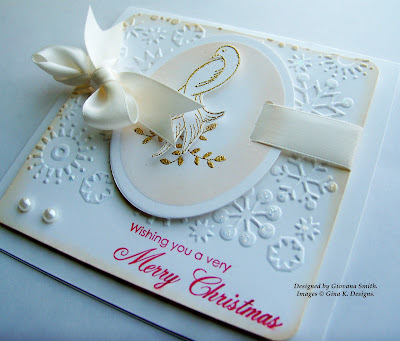 Finally I stamped the saying in White CS in Memento Rich Cocoa and cut and embossed it with Oval Nestabilities. A couple of tiny gold rhinestones were added. Card Stock: Innocent Pink (Gina K), Red from Bright Collection (DCVW), White (Gina K). Ink: Pretty in Pink (SU), Real Red (SU), Memento Rich Cocoa (Tsukineko), Antique Linen Distress (Ranger). 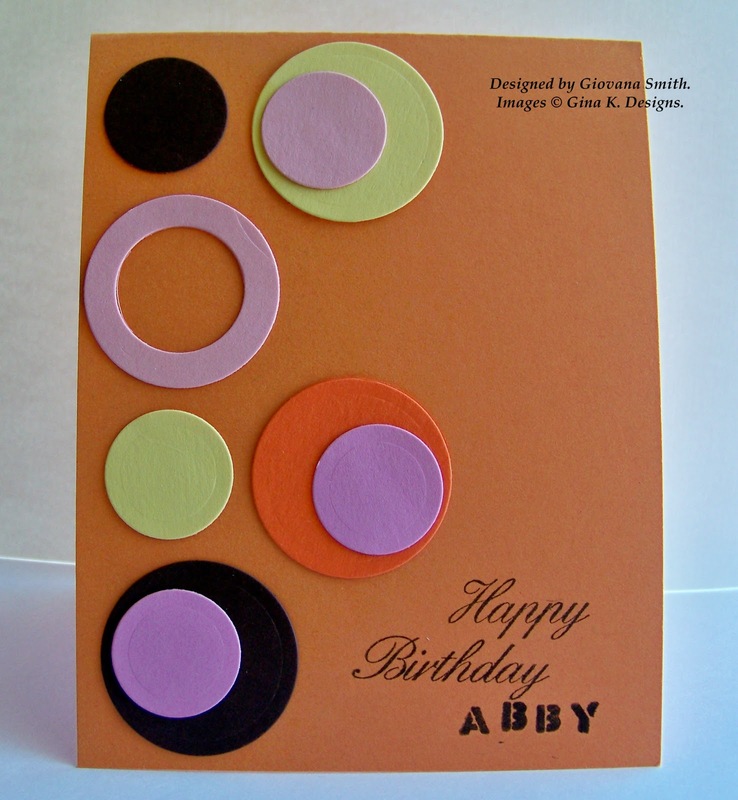 Accessories: Stamp-a-ma-jig, Oval Nestabilities, Dauber sponge. PS: Just in case, you have one more day to vote in the Gallery Idol! Just click my picture posted and it will send you direct to the site! Gallery Idol: Miss You Card! 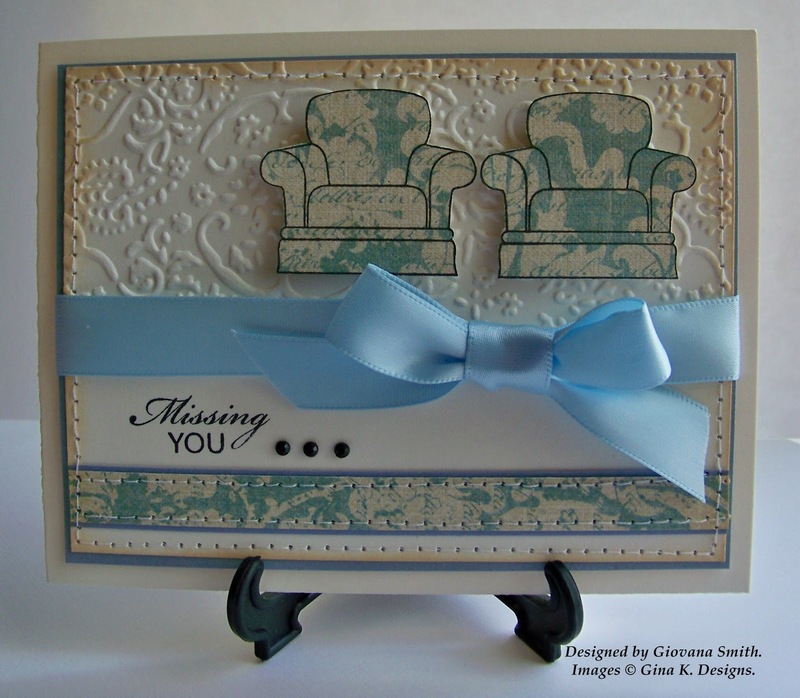 This round was to create card inspired by "Creativity Heals", that means Miss you, Sympathy, Get Well, Thinking of You and Encouragement cards. I decided to create a "Miss you" card. So, here is my card: Few details, I used the Emboss Resist Technique. I added some Glitter on the flowers. Ink: Real Red (SU), Espresso Adirondack (Ranger), Antique Linen Distress (Ranger), Clear Embossing pad. 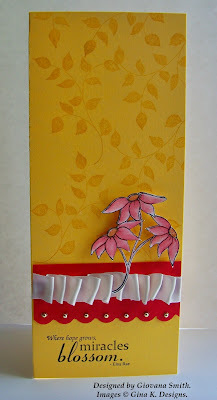 Embellishments: Mulberry Paper Flower (Prima), Pearls (Michael's). Sweet Blush Ribbon (PTI). Accessories: Sewing machine, Scor-Tape, Sugar Cube Glitter (Martha Stewart), Circle Nestabilities, Sponge daubers, foam tape, Diamond Glaze (JudiKins). 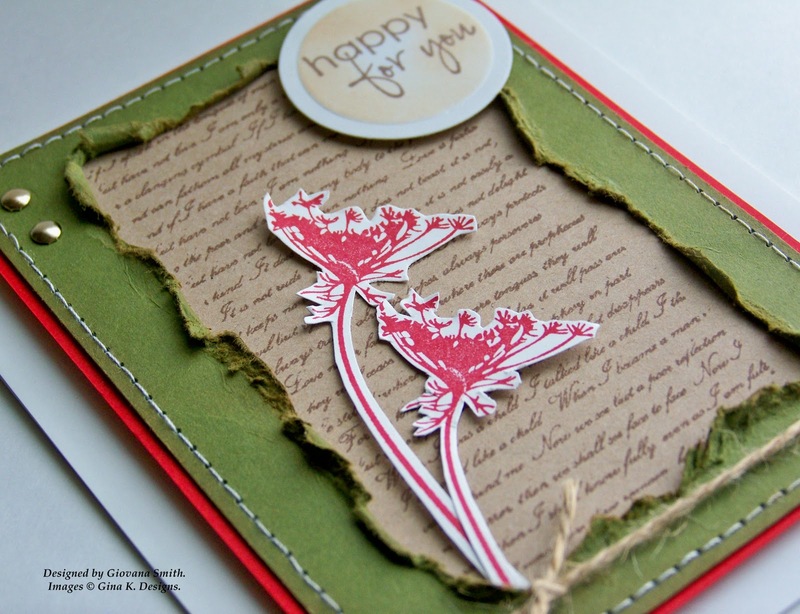 Gina K. Botanicals Blog Hop. Hello and welcome to another Gina K. Blog Hop! Tonight we are featuring the new Botanicals stamp set with a special technique themed blog hop event! I worked on these two techniques I love: Distressing and Sewing. So, for tonight I made 3 cards using these 2 techniques, shall we start? 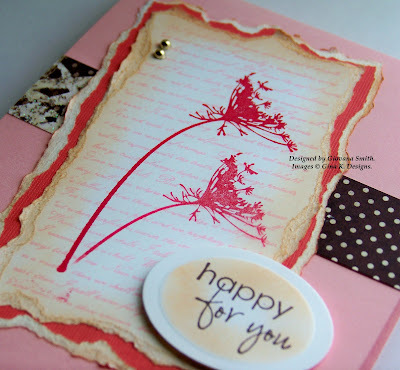 Happy for you Card: I stamped the BG image (love this one!) onto a piece of Kraft CS in Memento Rich Cocoa. I matted this with a piece of Red Hot CS. I added on top a piece of Fresh Asparagus, then torn apart. 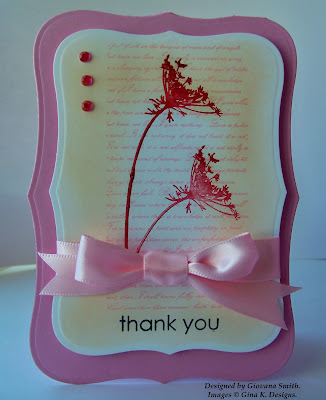 I stamped the flowers in White CS in Real Red Ink. The I added some straight stitches, 2 gold brads and some Jute twine. The card base is White. Ink: Memento Rich Cocoa (Tsukineko), Real Red (SU), Tea Dye Distress (Ranger). Embellishments: Gold brads, Jute twine. Accessories: Sewing machine, Foam tape, Dauber sponge. Thank you Card: I started this card with a piece of Chocolate Brown. I stamped the BG in Antique Linen Distress and leaves in Peeled Paint Distress onto a piece of Ivory CS. I matted this with a piece of Fresh Asparagus, stitched them together and distressed the borders. I stamped the sentiment in a piece of Sweet Corn CS in Memento Rich Cocoa, sponged the borders, finally I added some Green Lime Ribbon. Just add a piece of Scor-Tape and fold your ribbon! VOILA! I added a button and some Jute twine. Ink: Antique Linen Distress (Ranger), Peeled Paint Distress (Ranger), Memento Rich Cocoa (Tsukineko). Embellishments: Button (from Holiday Assorted Collection), Jute Twine. Accessories: Sewing machine, Mini glue dots, Scor-Tape, Dauber sponge. 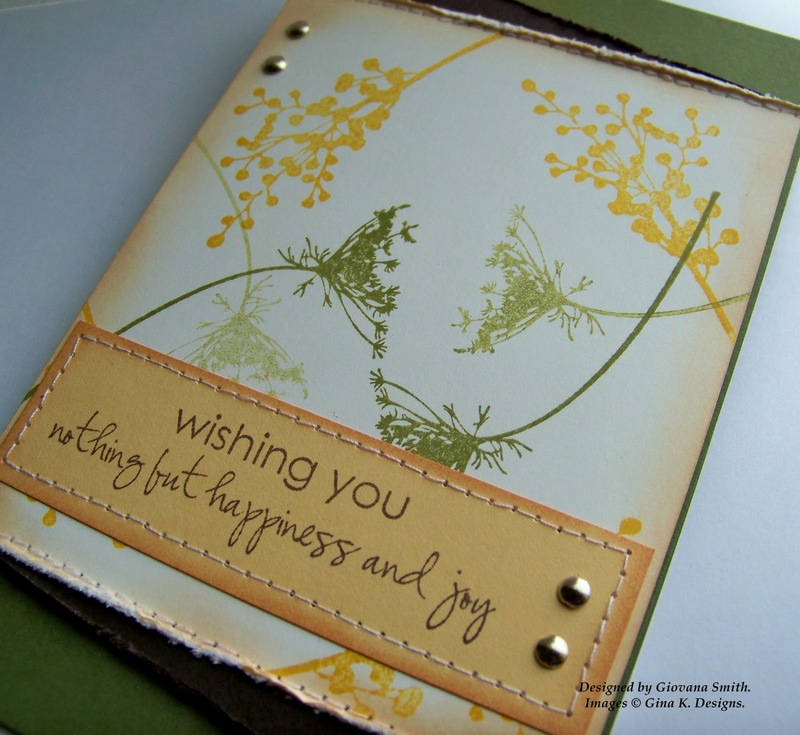 Wishing you Card: I started my card with a piece of Fresh Asparagus CS. I stamped the images in Crushed Curry and Peeled Paint Ink onto a piece of Ivory CS. I distressed and sponged the borders, then added some Chocolate Brown on the top and bottom part. I stamped the sentiment in a piece of Sweet Corn CS in Memento Rich Cocoa, I sponged the borders, then I added some straight stitches. Finally I added some Gold brads. Final size card is 4 ¼" x 7 ¾". Ink: Crushed Curry (SU), Peeled Paint Distress (Ranger), Memento Rich Cocoa (Tsukineko), Antique Linen Distress (Ranger). 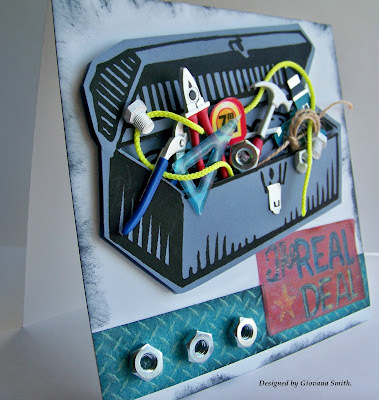 Accessories: Sewing machine, Dauber sponge, Foam tape, Stamp-a-ma-jig. Hope you like them! Which one is your favorite? Then, for even more samples with the Botanicals stamp set, visit the StampTV gallery here: botanicals. To view more information about the free card kit that is included with the purchase of the Botanicals stamp set, click here. Hello my friends! I hope you are having a great day. I planned to post this yesterday, but I felt miserable, I had sinus headaches all day, fever 100F all day too and body ache, no runny nose, no cough, no other symptoms. My daughter had a birthday party yesterday and sadly I couldn't go, I decided to stay home and rest, and believe I rested very well. My husband took DD to the party and I napped, I woke up when I heard the phone ringing.I napped for 3 hours!!! I felt a bit better after that, but still feeling dizzy and a lot of sinus pressure. So, here is the card I made for the birthday girl. 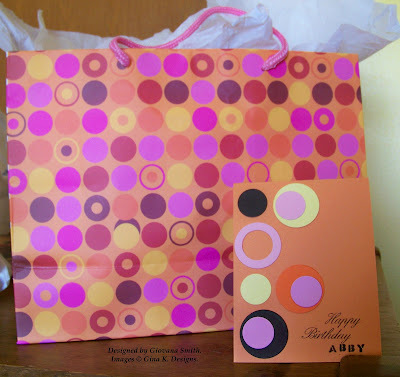 Her theme party was dots and I got inspired by the present bag. I cut the circles with Nestabilities dies using little scraps of CS, perfect for this project! Card Stock: Sweet Mango, Innocent Pink, Bubblegum Pink, Chocolate Brown, Lemon Drop (All Gina K), Orange (LSS). Accessories: Medium Glue Dots, Circle Nestabilities. Hope you like it. I have another post later! Gina K Blog Hop!! Hello my friends! I hope you are having a great day! I have heard on the news the weather is warm pretty much everywhere, but in WA State, what's up with that! We had a couple of days of "kind of warm" temperatures (68F), and now we are back with rainy days again! Anyways, I have some exciting news for you! I am a Hostess Challenge over at Stamp TV!! Stamp TV just launched a brand new "Christmas Challenge" and I hope you can join me to this new adventure for the next 3 months!! To be honest, I was a little bit scared, but now I feel much better. I started my card with a piece of White PL, folded in half. 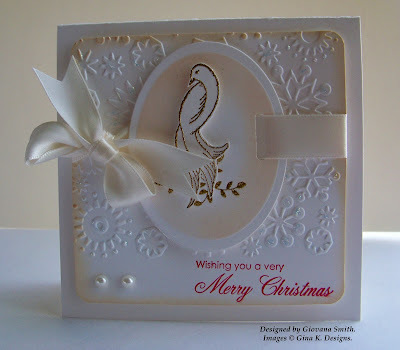 Then I cut a piece of White PL, stamped the sentiment and cuttlebugged using the Snowflake Folder, sponged the borders. I stamped the leaves in Gold ep, the dove was stamped and heat embossed in another piece of CS, then cut out and positioned on top of the leaves. I adhered some Antique White Ribbon around and added some Pearls. Ink: Real Red (SU), Antique Linen Distress (Ranger), Clear embossing pad. Embellishments: Pearls (Michael's), Antique White Ribbon (Offray). Accessories: Oval Nestabilities, Cuttlebug, Snowflakes Folder, Daubers, Gold Embossing powder, Embossing gun, Corner Punch, Foam Tape.